Two new models with up to 20-feet working widths offer tough flexibility. Rhino's Flex-Wing line of mowers grew by two for 2011 with the introduction of the FN240 and the FR240 models. Aimed at large commercial agriculture and industrial use, the improved designs are available in working widths from 10.5 feet to 20 feet and are made to clear brush up to 5-inches in diameter. The FN Series come with a 7-gauge deck and replaceable side skirts, "Big Foot" center section skid shoes and heavy-duty pan blade carriers. The FN's wings flex 90 degrees up to 22 degrees down for mowing flexibility. The FR Series boasts heavy-duty slip-clutches that protect the main driveline from shock loads, and gear boxes designed with cast lower seal protection and one-piece housings. 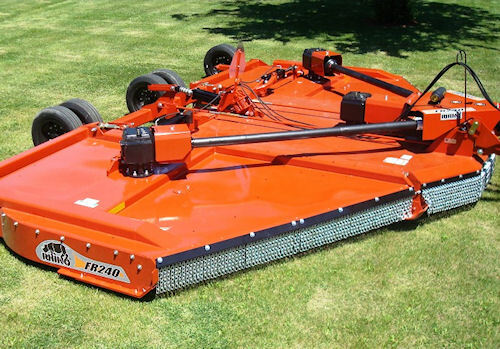 Both models offer clean cuts with spring-cushioned, mechanical level axles, front-to-rear ground leveling rods, and one-half-inch by 4-inch updraft blades on six-inch overlaps. For more information, call (877) 408-3297.